The Totnes pound is a complementary local currency, intended to support the local economy of Totnes, a town in Devon, England. The initiative is part of the Transition Towns concept, of which Totnes is a pioneer. According to the Transition Town Totnes website this means that it is „a community in a process of imagining and creating a future that addresses the twin challenges of diminishing oil and gas supplies and climate change, and creates the kind of community that we would all want to be part of“. A Totnes Pound is equal to one pound sterling and is backed by sterling held in a bank account. The Totnes Pound was re-launched in June 2014 in denominations of t£1, t£5, t£10 and t£21. The final designs feature the author Mary Wesley, ‚father of the computer‘ Charles Babbage, musician Ben Howard and the social activist and philanthropist Dorothy Elmhirst. 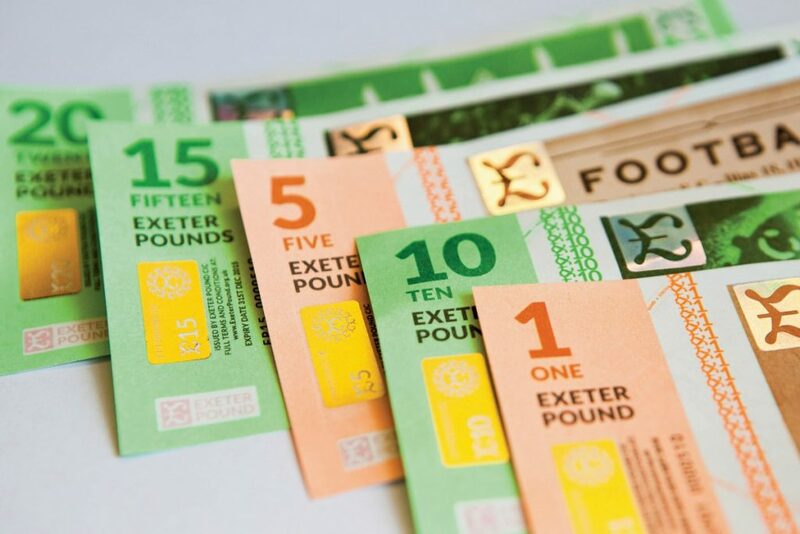 As of July 2014, more than 120 businesses in Totnes were accepting the Totnes Pound, and more than £12,000 worth of the currency had been issued.